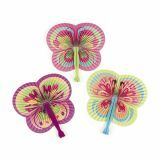 Colorful Butterfly-Shaped Folding Fans. Unfolded, 9 1/2". 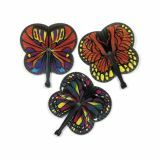 Paper Butterfly-Shaped Folding Fans. Assorted styles. Each with a plastic handle. 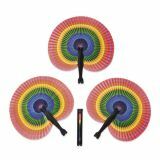 (1 dz./DB) 9 1/2"
Assorted colors. Holds 1-oz. of water. 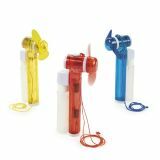 Includes 6" fan with 11/4" foam blades on a 40" nylon cord. Requires 2 “AA" batteries, not included. Paper with plastic handles. Unfolded, 10".